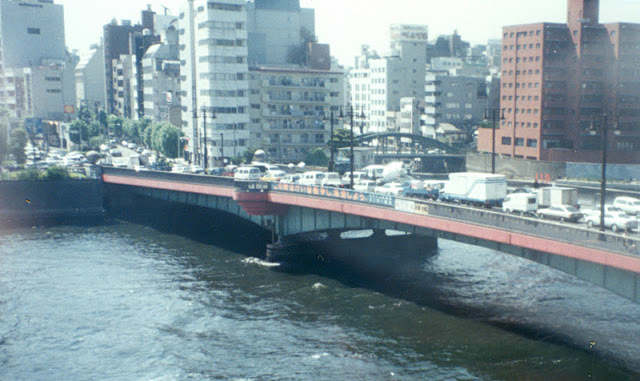 Continuing downstream on the Sumida River we come to the Ryogoku Bridge. This structure was built in 1932 to replace a timber bridge from 1659. Many timber structures were rebuilt in the 1930s, due to the devastating fire that followed the 1923 Great Kanto Earthquake. The original Ryogoku Bridge has been depicted by Hiroshige, Hokusai, and other artists and writers. The name Ryogoku means two provinces because the original bridge joined Edo and Shimosa. Eventually, the surrounding neighborhood was named after the bridge. The following link shows a print of the Ryogoku Bridge from 1830. The Sumida River looks so wide in this print that we can barely see the opposite bank. This must have been before the Arakawa River was diverted from the Sumida River for flood control. Also, Mt. Fuji can be seen quite clearly behind the bridge. I've noticed that this custom of putting Mt Fuji behind depictions of bridges continues on new Japanese bridge projects. The current bridge is a three-span steel haunched girder bridge with a dropped-in section on the center span. The bridge is 164.5 m long and 24 m wide. It is highly decorated with concentric circles at the bastions, spheres on pedestals at the abutments, and a wave-like motif on the interior railing. This is very similar to the Art Deco style that was being used in Europe and the United States in the 1930s. Tokyo's River Crossings: Ryogoku Bridge across the Sumida River (1) by Mark Yashinsky is licensed under a Creative Commons Attribution-Noncommercial-No Derivative Works 3.0 United States License.